If you fancy yourself KFC's rendition of chicken and waffles, you may wish to book a trip up north to Canada where the fried chicken chain is set to introduce the new Waffle Double Down starting March 26, 2018. The new, limited-time menu item features two fried chicken filets sandwiching a Belgian waffle and, for a Canadian touch, maple aioli sauce. 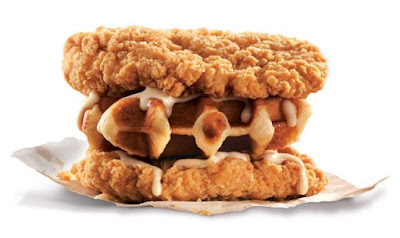 While the Double Down has sported several permutations across the globe (including one combining beef, pork, and chicken, a hot dog version, and one with a rice patty), this marks the first time waffles have found a place inside the sandwich. It hasn't been seen here in the US since 2014.